I first started learning how to use graphic design software back in 1995, but it wasn’t Photoshop. It was Corel Photo-Paint which, hard to believe now, was a legitimate competitor to Photoshop on Windows at the time. I learned it because I was working at Corel, writing the user guide for Photo-Paint. And although I was totally new to this type of product, it didn’t take me long to learn it because the interface looked and behaved like a lot like other Windows products. Over the course of several years, I did try to learn Photoshop a few times but I always quickly gave up because I found the interface really confusing and I couldn’t figure out how to do a lot of really common things. Even when I worked at Adobe, I kept using Photo-Paint for any graphics work I did at home because it was just so much easier. But a few years ago I took a job that required me to do graphics as part of it so I had to finally really learn Photoshop. Since then, I’ve become fairly proficient with it but there are still lots of things that drive me crazy about the product, especially things that I consider to be completely basic tasks. So when I recently learned how to do a few of these things I decided I should share them here to hopefully help others who have felt the same frustration when trying to copy layers from one document to another, drag layers onto the canvas, and align layers to the canvas. Note: All these tips apply to Windows. I know that there are some features in Photoshop for Macs that aren’t available for Windows, so if you’re a Mac user, these may not be a problem for you. I will NEVER understand why Adobe refuses to implement standard copy and paste functionality in Photoshop. And while there are a few different ways to copy layers from one document to another, the ones I previously knew were either a hassle (draggin and dropping involves several steps) or sub-optimal (selecting, copying and pasting a layer doesn’t take layer styles along with it and doesn’t work for groups). Select the layer(s) or group you want to copy to another document. 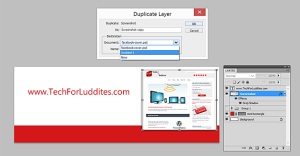 Go to Layer > Duplicate layer (or get to it by right-clicking the layer name in the Layers palette). In the Duplicate Layer dialog box, select the document you want to paste the layer into from the Destination dropdown list. Note: If you don’t have a document open, you can create a new one from that dropdown list, which will be the same size as the document you’re copying from. Click OK and go to the new document. The layer will be in the new document with all the same styles, in the same location it was in the original document relative to the top left corner. There are various times when you’ll have layers in your document that are located outside of the canvas. You may have moved it there temporarily or maybe in the example above you pasted the layer into a document that’s smaller than the original. Now one would think that you could simply select the layer and when the bounding box appears, drag it to the canvas. Uh, no. It just stays locked in place. You can use the arrow keys to nudge the layer, but that is a slow process depending how far it’s off the canvas. Press Ctrl + T to activate the Transform function. Now you can drag and drop the layer wherever you want it.Note: You will have to hit Enter or click the checkmark button to apply the “transformation,” (another thing I hate about Photoshop). This is definitely something I do a lot and in Photo-Paint this was just another alignment option to go along with aligning layers to each other. Again, why Adobe won’t just add that option is a mystery… My workaround used to be aligning g layer to the background but if you have a lot of layers, scrolling down to the background is not convenient. Plus, some documents don’t have backgrounds at all. So when I learned this little secret just last week, I practically danced with joy, and I’ve used it dozens of times since then. Select the layer(s) you want to align to the canvas. Press Ctrl + A to select the entire canvas. Use the standard align buttons/commands to align the layer to the top/middle bottom, left/middle/right of the canvas. Press Ctrl + D to deselect the canvas. These may seem like small things, but if you do a lot of work in Photoshop (like I do), every unnecessary step you can cut out makes a big difference. By the way, if you know any better ways to do any of the above things, please leave a comment below!